A Tory government would encourage schemes under which people would be paid to recycle, shadow chancellor George Osborne is due to announce. Mr Osborne will argue that current government policies are unpopular and suggest that "instead of using sticks, we can use carrots" to boost recycling. Firms in the US have shown how to "make it pay to go green", he will add. In a speech to pressure group the Green Alliance, he will also say landfill tax rates would not fall under the Tories. "This will send a powerful signal to businesses and councils that innovative approaches... are possible," he will say. Environmental campaigners say British recycling rates are low compared with other European countries. 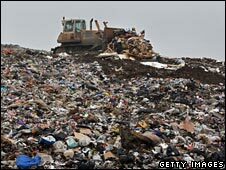 Mr Osborne will tell the Green Alliance that he has found his solution in the US, where, as in the UK, councils pay a tax on every tonne of rubbish they send to landfill. He is expected to highlight some US companies which offer to cut the landfill tax bill by increasing recycling rates. These firms use financial incentives to get the public on board - the more people recycle, the more they can earn - and then themselves earn a share of the savings in landfill tax payments to local authorities. Mr Osborne will say: "Instead of being fined for not recycling, households are actually being paid for their recycling. "Instead of using sticks, we can use carrots instead. Instead of punitive taxes, we can use financial incentives." In some communities, such schemes have increased the amount of household waste being recycled by more than 200%, Mr Osborne will add. "I want to see this innovative approach rolled out across the UK." He will say the Conservatives are working with the Local Government Association, the Mayor of London's office and Tory local authorities, such as Windsor and Maidenhead, in Berkshire, to explore how such schemes might be implemented. Earlier this year, the government asked councils whether they were interested in running pilot projects which would reward recycling. In 2004/5, the most recent year for which comparable figures are available across the EU, the UK dumped more household waste into landfill than any other country in the European Union - 22.6m tonnes. In the same period, France sent around 12m tonnes to landfill, Poland about 8.6m and Germany about 7.3m. Can our reporter do without it for a month? Recycling: Where does it go?